Margaret Murrey (Treasurer), Susie Jenning (New Regional Director), Suzy Parker (OAGC First Vice President), Briggs Shoemaker (Speaker), Babs Sabick (Speaker), Sara Spurlock (Secretary) at the last regional meeting. Babs Sabick told the story of the use of quilts by the Underground Railroad. OAGC Foundation Scholarship recipient Briggs Shoemaker shared his experiences. SYRACUSE — “Think Spring” is the theme of the Region 11 Ohio Association of Garden Clubs (OAGC) meeting on Saturday, April 28. 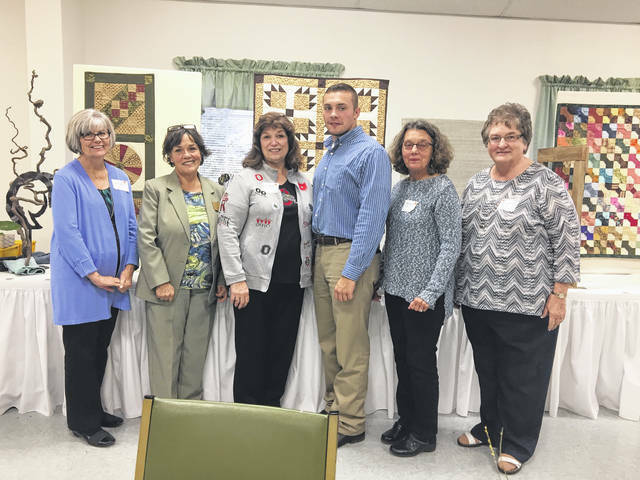 The Garden Clubs of Meigs County have been busy planning the event which will be held at the Syracuse Community Center. Region 11 includes Athens, Gallia and Meigs Counties, and guests will gather at 8 a.m. for registration and breakfast. Following a business meeting, Vic Wolf will present a program on Bees and Honey, and Athens-Meigs County Extension Agent Kevin Fletcher will speak on Beneficial Plants and Insects. After lunch, Meigs County floral designers and OAGA members will be illustrating designs. Also available to members are door prizes, a silent auction, and sales of plants and gardening related wares. 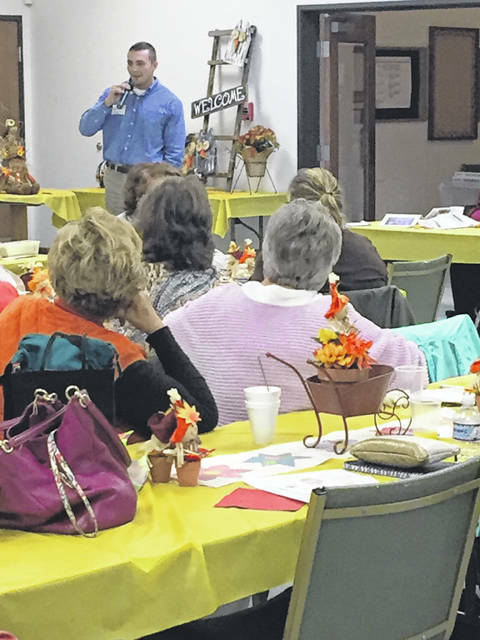 In October, the Garden Clubs of Gallia County were host to the Region 11 Fall Meeting at Life Lutheran Church in Gallipolis. With a theme of “Reflections of Fall in Gallia County,” Susie Jenning was introduced as the new regional Director. The day included a business meeting, luncheon, and programs. Briggs Shoemaker shared his experiences since receiving the OAGA Foundation scholarship. Shoemaker attended the Ohio State University majoring in agriculture and business. After graduation he joined the Ohio Farm Bureau and became their Organization Director for Athens-Meigs, Gallia and Lawrence Counties. 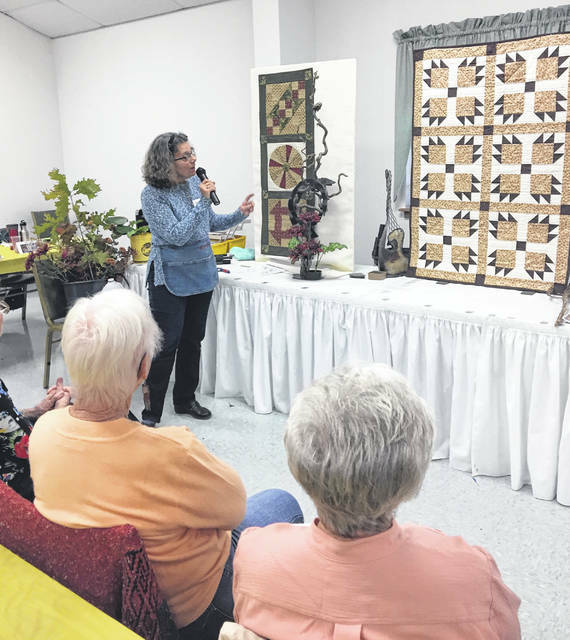 The idea that quilts were used to communicate information about meeting places and safe houses for Underground Railroad was explored by Babs Sabick in her presentation. What became known as the Underground Railroad allowed the passage of African Americans held in slavery to freedom in “free” states and Canada. Abolitionist and those sympathetic to their cause became “Conductors”, and used an elaborate network and various sources of communication, including quilts, to guide the fleeing people safety. Sabic provided examples of quilt patterns that were used and told the story as follows: The Monkey Wrench turns the Wagon Wheel toward Canada. With help from Jesus, the Carpenter, follow the Bears’ Trail through the woods. Fill your Baskets with enough food and supplies to get you to the Crossroads. Once you get to the Crossroads, dig a Log Cabin in the ground. Shoofly told us to dress up in cotton and satin Bow Ties. Follow the Flying Geese and Birds in the Air, stay on the Drunkard’s Path. Take the Sailboat across the Great Lakes to the North Star above Canada. With the quilts as a backdrop, she designed arrangements with each quilt pattern as inspiration. This event is for members only, but if you would like more information about joining OAGC or a garden club in your area, contact Susie Jennings, Director for Region 11 by calling 740-797-0372, or visit oagc.org.